Sparrow & Vine is my ongoing winemaking baby. The first vintage was 2010 and it has always been based on fruit from the Doecke vineyard, on Gawler Park Rd in the Eden Valley sub region of the Barossa. The Eden Valley is higher and cooler than the Barossa floor and the fruit ripens later, with ensuing wines offering notes of spice and fresh red fruit flavours. I’m trying to produce wines that are soft and accessible and with cooler region sense of vibrancy. Most of all they need to have drinkability. The 2016 Sparrow & Vine Single Vineyard Grenache (available here) is entirely off the Doecke Vineyard, which was planted by Bruce Doecke in 1964. He still tends it today. Handpicked and crushed, fermented with wild yeasts, basket pressed and aged for 12 months in older French oak barrels. It was made with Wayne Ahrens at Smallfry Wines. It’s got lovely lifted red fruit aromatics along with the spice notes that I was after. The pepper / nutmeggy notes flowing onto the palate with taut raspberry and red cherry flavours. It’s lithe, lively and long. And drinkable. I’m very happy with it. 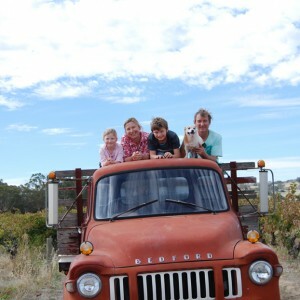 Wayne Ahrens and Suzi Hilder are the custodians of some exceedingly fine vineyards. Both from grape growing families of long standing they planted a vineyard in the Eden Valley and purchased a beautiful block of ancient vines in the Barossa Valley sub-region of Vine Vale. With patience, intelligence and sheer graft these vines are now producing grapes sought after by some of the best winemakers in Australia. A commitment to sustainable practises and certification as Biodynamic producers both in the vineyard and winery is further proof of the dedication to quality. The excellence of the Smallfry wines is a reflection of the dedication in the vineyard. The wines are very much hand-made, non-interventionist styles with no additives and only older oak used. They showcase the regional Barossa styles in a modern, fruit focussed vein. A five star producer and “one to watch” in James Halliday’s Wine Companion Smallfry is a winery most definitely on the rise. Il Passero is an Italian style offshoot of the Sparrow. There are two wines, a small parcel of Nebbiolo from Gundagai in NSW and a Sangiovese from King Valley in Victoria. They are bottled exclusively for Sparrow & Vine. Nebbiolo is the noble grape variety of Piedmont in North West Italy and often draws comparison to the Pinot Noir wines of French Burgundy. This particular Nebbiolo hales from the NSW region of Gundagai and has echoes of both regions. With a delicate aroma of rose petals and a palate of fine red fruits and chewy tannins it’s the perfect food wine. And a little bit exotic too, offering Euro style with a distinct Australian accent. Domaine La Sarabande was established so that Australian winemaker Paul and his Irish wine Isla Gordon could fulfill their dreams of making serious long living robustwines. The vineyards have been carefully selected to establish a balanced mix of schist soils, good drainage, good aspect and a mix of young and very old vines. The vineyards are organic and the winemaking is a combination of old and new world techniques. The wines are hand harvested, naturally fermented and are bottled unfiltered and unfined. The strong emphisis is to bottle wines that express the soils and climate of the vineyard while being technically correct and are free of wine faults. Faugères is an ancient wine growing region tucked between the Meditteraen and the Cevenne mountains deep in the Languedoc.The major influence on the wines of this appellation is the distinctive schist soils.